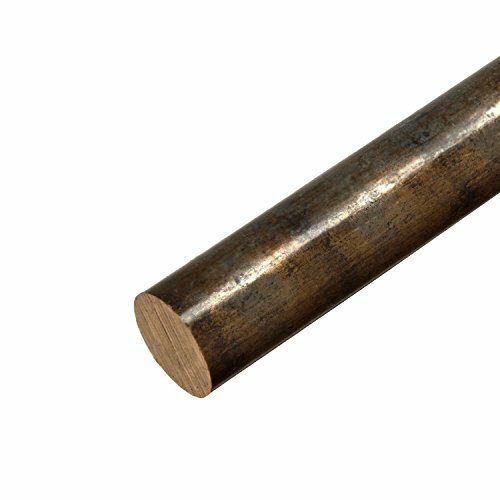 The 932 bronze round rod is cast and unpolished, meets American Society for Testing and Materials International ASTM B584-78 and Society of Automotive Engineers SAE CA932 specifications, and has a standard tolerance. The 932 bronze alloy, also known as bearing bronze and SAE 660, is corrosion resistant and has high strength and machinability due to its lead content. The material has been liquefied and poured into a mold, then cooled to create the shape. 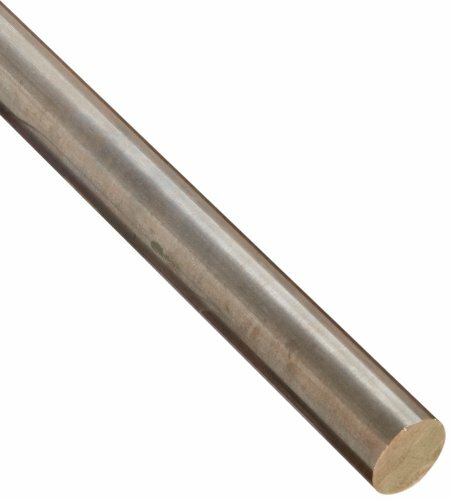 The 841 bronze round rod is sintered, meets American Society for Testing and Materials International ASTM B438-73, Society of Automotive Engineers SAE 841, and United States Military Standard MIL-SPEC B-5687C specifications, and has a standard tolerance. The 841 bronze alloy, also known as oil-impregnated bronze, contains oil for high wear resistance and self-lubrication. The material has been sintered for consistent mechanical properties throughout. 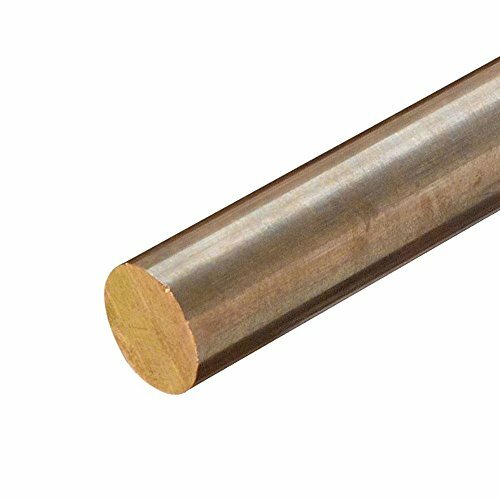 The 655 bronze round rod with H04 temper is unpolished, meets American Society for Testing and Materials International ASTM B98 specifications, and has a standard tolerance. The 655 bronze alloy has high strength and corrosion resistance with better formability than 642 bronze due to its higher silicon content. The material has an H04 temper, meaning it has been cold worked to a hard temper. The 655 bronze round rod with H02 temper is unpolished, meets American Society for Testing and Materials International ASTM B98 specifications, and has a standard tolerance. 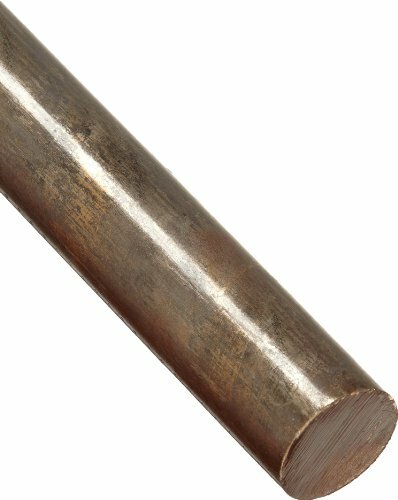 The 655 bronze alloy has high strength and corrosion resistance with better formability than 642 bronze due to its higher silicon content. The material has an H02 temper, meaning it has been cold worked to a 1/2 hard temper. 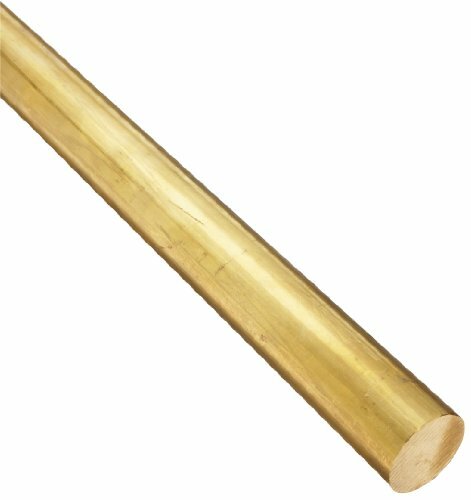 The 385 brass round rod with H02 temper is unpolished, meets American Society for Testing and Materials International ASTM B455 specifications, and has a standard tolerance. The 385 brass alloy, also known as free-cutting or architectural brass, provides corrosion resistance and high machinability due to its high lead content. The material has an H02 temper, meaning it has been cold worked to a 1/2 hard temper. C90700 (SAE 65) Tin Bronze is primarily used as a gear bronze or in other high wear constant movement applications. Conforms to continuous cast specification ASTM B505. Chemistry: Cu89 Sn11 Min. 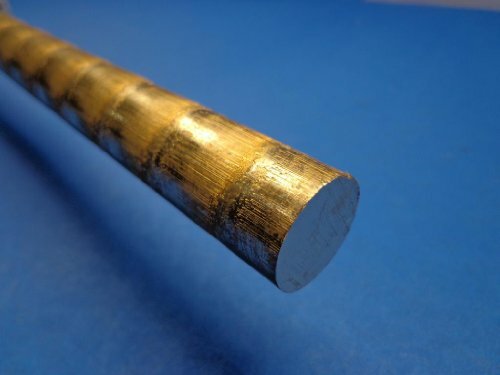 Mechanical Properties: 38 ksi tensile, 25 ksi yield (0.5% Ext. under load), 18% elongation in 2 inches, 65 Brinell Hardness (500 kg load) Applications: Heavy duty gears, high load bearings, bushings and worm wheels. 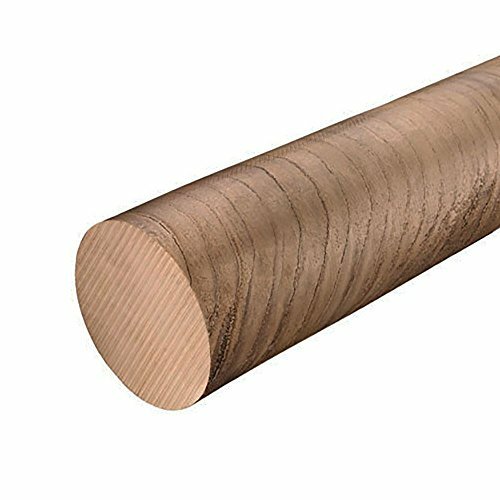 Material: Bronze Alloy: C907 Shape: Round Rod Diameter: 2.500 (2-1/2 inch) Length: 12 inches Finish: Unpolished (Mill) Item Weight: 18.96 lbs Notes: Diameter is oversized to allow for finishing to listed size. Diameter is oversized to allow for finishing to listed size. C90700 (SAE 65) Tin Bronze is primarily used as a gear bronze or in other high wear constant movement applications. Conforms to continuous cast specification ASTM B505. Chemistry: Cu89 Sn11 Min. Mechanical Properties: 38 ksi tensile, 25 ksi yield (0.5% Ext. under load), 18% elongation in 2 inches, 65 Brinell Hardness (500 kg load) Applications: Heavy duty gears, high load bearings, bushings and worm wheels. Material: Bronze Alloy: C907 Shape: Round Rod Diameter: 2.500 (2-1/2 inch) Length: 6 inches Finish: Unpolished (Mill) Item Weight: 9.48 lbs Notes: Diameter is oversized to allow for finishing to listed size. C90700 (SAE 65) Tin Bronze is primarily used as a gear bronze or in other high wear constant movement applications. Conforms to continuous cast specification ASTM B505. Chemistry: Cu89 Sn11 Min. Mechanical Properties: 38 ksi tensile, 25 ksi yield (0.5% Ext. under load), 18% elongation in 2 inches, 65 Brinell Hardness (500 kg load) Applications: Heavy duty gears, high load bearings, bushings and worm wheels. Material: Bronze Alloy: C907 Shape: Round Rod Diameter: 2.500 (2-1/2 inch) Length: 8 inches Finish: Unpolished (Mill) Item Weight: 12.64 lbs Notes: Diameter is oversized to allow for finishing to listed size. C932 | SAE 660 Bronze, is commonly known as "bearing bronze" and is the most commonly used bronze in bushing and bearing applications. It easy to machine, and provides long life span, where wear is a important factor. Material: Bronze Alloy: C932 Shape: Round Rod Diameter: 5.000 (5 inch) Length: 3 inches Number of Pieces: 1 piece(s) Notes: Diameter is oversized to allow for finishing to listed size. Diameter is oversized, to allow for finishing to listed size. C932 | SAE 660 Bronze, is commonly known as "bearing bronze" and is the most commonly used bronze in bushing and bearing applications. It easy to machine, and provides long life span, where wear is a important factor. Material: Bronze Alloy: C932 Shape: Round Rod Diameter: 6.000 (6 inch) Length: 1 inch Number of Pieces: 1 piece(s) Notes: Diameter is oversized to allow for finishing to listed size.